Most of the goods we consume are transported by sea on ships where working conditions recall those of the galley ships of another age. 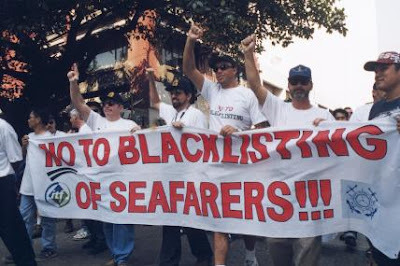 Turbulent Waters takes us into this murky world where ship owners, (like the family of former Canadian Prime Minister Paul Martin) avoid operating standards and working conditions in force in their own countries by registering their ships offshore in tax havens like Panama, the Bahamas, or Liberia. They then hire seafarers for cheap in the Philippines, India, China, or the Ukraine. Turbulent Waters tells the story of some of these seafarers - equivalent to 21st century galley-slaves - and of the turbulent seas they inhabit in the world of corporate globalisation. The feature-length documentary is directed and written by Malcolm Guy and Michelle Smith. Sprite Zungu, an inspector with the International Transport Federation, defends seafarers who have decided to go on strike because they have not been paid for several months. Turbulent Waters tells the story of these seafarers -- equivalent to 21st century galley slaves -- and of the turbulent seas they inhabit in a world of corporate globalisation. Scene from the film Turbulent Waters by Malcolm Guy and Michelle Smith.